For quite a few years now I have been one of the worship leaders for our small congregation, right now for a month every three months. That means I prepare every aspect of the worship service apart from the sermon. Hymns have always been an integral part of our worship, chosen to emphasize a worship theme that is typically summarized as "We worship God because...," because "we are His people," or "He is our source of Peace," or "He is faithful," etc. You get the idea. Consequently I didn't want to be limited to the hymns in a single hymnbook. 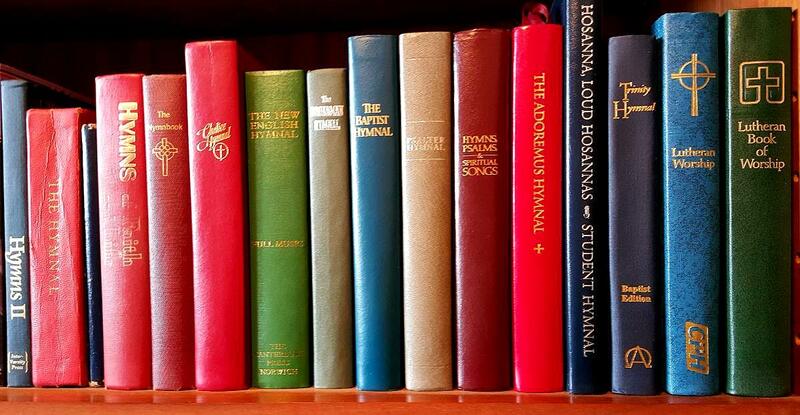 I have an uncle who collects hymnbooks as does the pastor of my church. My collection is paltry compared to theirs, but then when they started they had no access to the additional resources now available online. This is my shelf of hymnbooks. The Hymnbook is the one I grew up with in the Milton Seventh Day Baptist Church. The Madison church to which I belong uses two: Hymns of Faith and Life and Psalter Hymnal, a hymnbook published by the Christian Reformed Church, acquired because we wanted the possibility to sing all of the Psalms. Combining those with books from Lutheran, Anglican, Catholic, Reformed, Wesleyan, and Baptist traditions almost guarantees that I can find a hymn appropriate to the theme that is also singable, i.e. good orthodox words to good music. If I can't find what I want from the books, I can find it at an online site like Cyberhymnal.